The Alaska Humanities Forum’s HUMAN:ties initiative explores the influence of human connection on one's sense of physical, psychological, and spiritual well-being through investment in social practice, creative advocacy, and community dialogue. 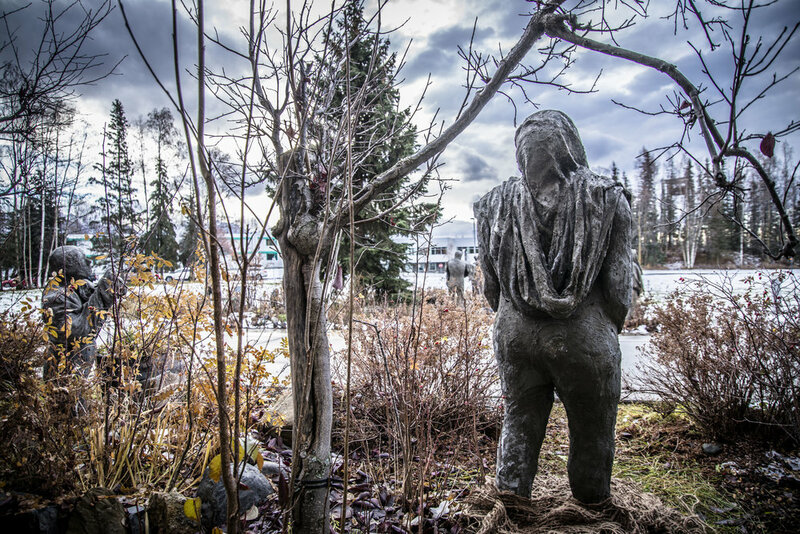 Inspired by the statewide social impact of Sarah Davies’ 100Stone Project on Alaskans affected by acute emotional vulnerabilities, the Alaska Humanities Forum is launching the HUMAN:ties Social Practice Grant. We invite individuals or groups of Alaskans from all creative practices to propose a creative advocacy project of their own imagining with the goal of addressing diverse experiences of isolation and promoting a deeper understanding of the invisible ties between self and community. This first year, HUMAN:ties seeks projects that attempt to illuminate diverse definitions and experiences of homelessness in Alaska and the unique issues embedded in its experiential fabric. Alaska has some of the highest per capita rates of homelessness in America. The 2015 Point in Time Count surveyed 1,956 homeless individuals statewide, a nine percent increase over the previous year. Given the difficulties of defining homelessness and locating homeless individuals identified as such, this count is broadly assumed to be an underestimate. HUMAN:ties seeks to promote an in-depth exploration of self and community among those who identify as homeless, and inspire local community members to illuminate homelessness as only those who experience it can by joining an “army of fearlessly vulnerable allies”, as Sarah Davies referred to the community that helped her build 100Stone. The HUMAN:ties Social Practice Grant will provide $10,000 to an Alaska-based individual or group of creators who seek to affect social change through socially engaged art. The grant recipient will propose a social practice artwork aligned with the HUMAN:ties focus. The resulting artwork must be in Alaska and open to the public. It may be permanent, ephemeral, visual, literary, performance, or any combination thereof. It can be placed within a single community, be moved among communities, or exist separately in distinct communities at once. The project period for the grant project is September 30, 2017 – September 30, 2019. Applications are due August 31, 2017. Perhaps one day I will find the language to express what it feels like to have made 100Stone Project with hundreds of others, and to be part of a global army of fearlessly vulnerable allies. Until then, the psychic debt I feel to my community for giving me a life of such quality is tremendous. For that reason, I feel compelled to pay forward what I have been given. It all started with an invitation. In January 2014, the Northern Placemaking Initiative gave our proposal a change at life, a grant of $15,000, and an indomitable team of supporters as we moved through the uncharted creative and social territory that became 100Stone Project. Over the course of the next 2.5 years, the project built a network of allies within and beyond our Alaskan borders as we worked to realize our unique vision of suicide and mental health awareness. Among them, the Light Brigade, Anchorage Park Foundation, Alaska Mental Health Trust Authority, MatSu Health Foundation, Atwood Foundation, Rasmuson Foundation, Ironworkers 751, Laborers 341, 70 community partners and nearly 600 volunteers collectively united to support the amplification of 100Stone’s message of truth, resilience and common human experience. Together we united in a movement to illuminate the stories of our most vulnerable community members, thereby severing the taproot of actualized suicide—isolation. Now, with deeply embedded roots in my community, and an army of allies behind me, I am strong enough to offer that same gift to another. Before next year is over I want to see that someone else has the same chance I was given. Why is this important? Why not just invest in myself? …because if you have found yourself on this page you must understand the gravity of this project. The 100Stone Project and this granting initiative are a continued, fearless pursuit of levity, empowerment, and peace in a world thick with shame and stigma. Some of us have entered this battle creatively, some quietly, some have perished, and some have become fearsome warriors on the front lines of the war against that which keeps us isolated. I’ve initiated this project because we must keep moving forward, together. I had no idea the life 100Stone would take. I had no idea of its Real power. I imagined it as an awareness project, creative activism, a battle against forces that keep us shamed and unwell. I knew it was important, but what it has become is much more than all that. 100Stone has become a colossal act of empathy, compassion, physically performed in real time by hundreds of us in synchronicity with mother nature, witnessed by hundreds of thousands, possibly millions. Through 100Stone, an enormous affirmative attention has been brought to a huge diversity of our most difficult truths, where before there was silence, scorn, and shame. Every day we are able to touch our family of “stone” beings and witness all the lessons life has to offer them is another day to reflect on the stories of our hidden brothers and sisters, on love, on ourselves, and on who and how we want to be as we move through this world. Join me today as I try to find a way to seed that same reflection and imagination in our community again. With the blessings of their makers and models, I offer you the stones with which we can build this fund. Help me pay forward what 100Stone has given to me—to Us—so we might empower another to have the audacity to speak in ways only art can do. Please consider contributing today by sharing this with someone who might wish to select a Stone or make a donation at the link below. All dollars raised beyond our goal will go to the 2nd year of HUMAN:ties. In the future, the initiative will expand to engage additional groups that experience isolation including, but not limited to, seniors, returning veterans, immigrants, individuals recently released from prison, surviving family and friends of suicide loss, people affected by trauma, and people in recovery from substance abuse or addiction.